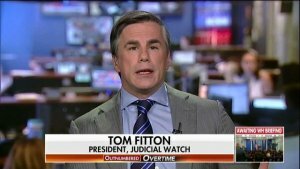 JW President Tom Fitton said Special Counsel Robert Mueller’s investigation is “irredeemably tainted and compromised,” and stressed that Attorney General Jeff Sessions needs to get back in the game and “take back control of this Justice Department from the Mueller-Rosenstein team. Rod Rosenstein is the deputy attorney general of the United States. He wrote the memorandum in 2017 recommending that FBI Director James Comey be fired, which triggered the special counsel investigation. Rosenstein appointed Robert Mueller as special counsel. “We shouldn’t wait two more years for another IG report to tell us what’s rather obvious, that his investigation is biased and compromised,” he said. (TLB) published this video report from Rick Wells.US with our thanks for the coverage. All of this has been going on and building up during the Obama years. By now, we have the investigators investigating themselves. Sessions could have taken some actions, but he was told by the Deep State to set on his hands. Trump is aware of that, so all he can do is play the game and express his exasperation like the rest of us for the time being. Around the corner after the midterms, Trump has sealed indictments ready to serve (we understand from sources) numbering well over 1,000 to start the swamp drain. Remember, Trump winning the election stopped a giant political machine dead in it’s tracks. Hillary was supposed to win. They did not call it right and they are still in shock and very very angry. The Deep State’s “Prize” was taken away and they want it back, come Hell or High Water. The November elections are pivital to this swamp cleanup. Everyone damn well better get to their polling place. It would be a disaster if we almost got to the crest of the hill and then started to slide back down due to the lack of momentum. We know you were looking for a short answer, but in this case there is no “simple.” Thank you for your comment and concern, Paul. Who is supposed to step in when things get off track like this and stop it, fix the broken track and get things back on the track again with regards to criminal activity and political partisanship affecting the rule of law, creating a double standard, and continuing this crooked investigation in a bubble? I am livid with the corruptness on display while everyone sits on their hands! !